New visual from Snowgoons featuring legendary Hip Hop duo Artifacts – ‘All City Kingz’, with Cutz by DJ XRated. The track is lifted of the upcoming Snowgoons album ‘Goon Bap’ dropping 12/12/12. Besides names like Method Man & Ghostface of the Wu Tang Clan, Dres from Black Sheep, Psycho Les from the Beatnuts, Onyx, M.O.P. and Dilated Peoples, the Snowgoons also easily manage to place a whole bunch of extremely gifted young guns on the album, proving real Hip Hop is alive and kicking in 2016. Check this EXCLUSIVE three minute film from last weekends world renowned UK Beatbox Championships, sponsored by Relentless Energy Drink at SCALA in London. 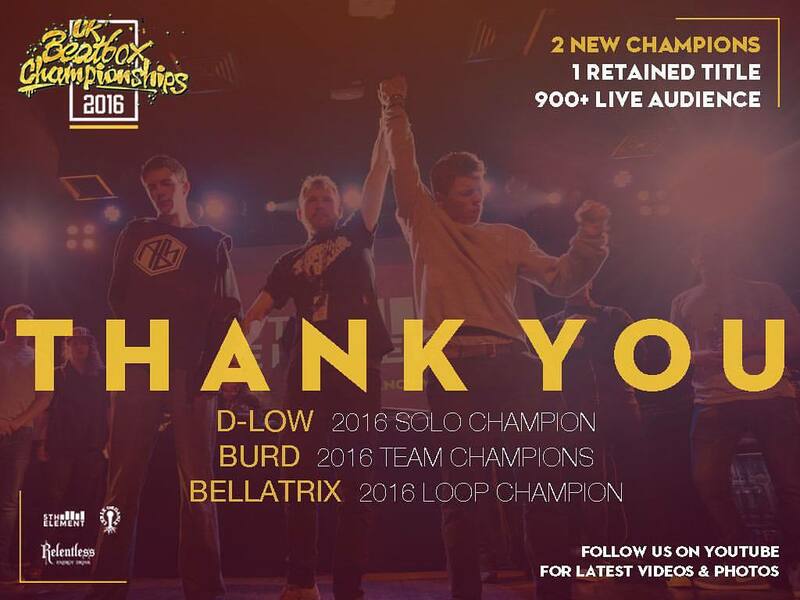 The film features key artists, judges and vibes from the day, as the best Beatboxers and fans from around the UK converged to see who would be crowned the winners of the three categories up for contention on the day….. Solo, Team and Looping. With World Class Beatboxers judging the event featuring France’s ALEM (World Solo Champion), Bulgaria’s PE4ENKATA (World Female Champion) and Australia’s TOM THUM this was a truly international event and competitors had to bring their A-game. The event brings together the world famous UKBC live show – a riotous, high octane battle competition with big cash prizes (courtesy of Relentless) and top music equipment (Korg and Samson) at stake – with the spotlight on the most cutting edge beatbox vocal artists in Britain. Alongside boundary-pushing live performances from the UK’s top artists at the forefront of Hip Hop and Bass culture. Hosting duties on the night were held down by TOO MANY T’s and NATTY SPEAKS and the event was supported with a heavy line up of Live music from ALIX PEREZ, DIRTY DIKE (High Focus) with DJ SAMMY B SIDE, Manchester’s CHIMPO & SKITTLES (LEVELZ), Beatboxer TOM THUM, THE BEATBOX COLLECTIVE (World Team Champions) and DJ BOBA FATT all combining to make this a legendary event. So after stiff competition and pushing UK Beatboxing to new levels who were crowned Champions?? Well, D-Low was crowned UK Solo Champion, while the all female team of BURD scooped up the UK Team crown for the second year in a row and Bellatrix took the Loop category. Big Thanks to Relentless Energy Drink, UK Beatbox Championships and Georgia at Easy Tiger PR for the Exclusive footage. Manchester emcee and producer Diligent Fingers is back with the second release a ‘Fist Full Of Change’ Live Freestyle over the RJD2 – ‘Seven Light Years’ instrumental. This track is lifted from Diligent Fingers ‘Jux To The Heart – Dil’s Winter Vol.4 ( 2016-17)’, as with previous years releases Dils dropping a fresh track every 2 weeks, resulting in 10 tracks and the final project possibly pressed to 100 limited CDs. Conscious Route brings you a new visual for ‘On Da Up’, this raw edgy truth of his life experience over a haunting reflective melody, produced by UK producer Micall Parknsun. Village Live Records presents their fifth record and third full length LP ‘Deep Into The Forest’ by Funkonami: a rich and organic tapestry of the toughest instrumental Hip Hop. Residing in the city of Athens Greece, Funkonami has been busy in the lab crafting this 90s infused masterpiece which Village Live have taken great care to bring to you in the physical formats of vinyl, tape and CD. Fourteen tracks deep, produced entirely with an E-mu sp1200, AKAI s950, Ensoniq EPS16+ and programmed with an AKAI MPC1000 the listener is presented with all the gritty warmth of Hip Hop’s golden era. Run of 300 LP’s, first 100 ordered will received limited edition green wax with custom OBI strip.